Yesterday, we posted some data about the high crime rates in Spokane. In reality, the crime rates are likely to be higher than stated. This is because the local government de-funded CrimeCheck, a telephone service that enabled residents to easily report non-emergency crime. The result was a plummet in the number of crimes reported. Later, Crime Check was restored and reported crimes went back up. The greenish colored line is reported property crime. 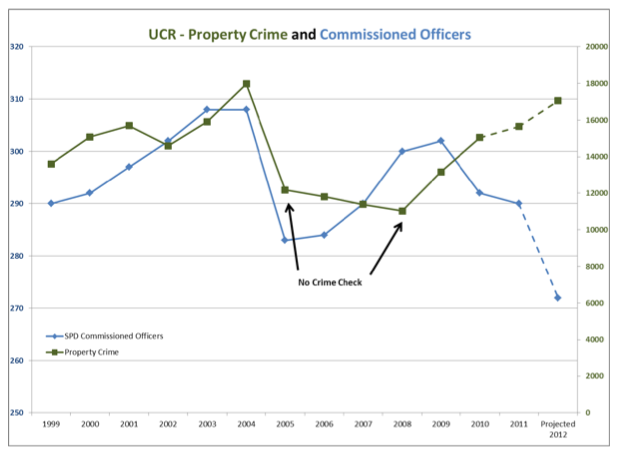 When CrimeCheck was shut down, reports of property crime dropped dramatically. (Chart comes from the Spokane Police Department). The PD estimated the reported property crimes based on “if Crime Check existed” – they just drew a curved line. Spokane’s crime report data is in such bad shape that we cannot draw any valid trend lines as to whether crime is getting worse or not. This was written about previously in “City of Spokane Crime Rate Trend“. This is probably not intentional, but then again, in the Scam and Fraud Capital of America, lots of people would like to hide the crime problems. Now, with the announcement that property crimes will no longer be investigated (in practice, they never were) and the shutting down of the property crimes investigative unit, fewer people will bother to make a property crime report. Why waste your time? 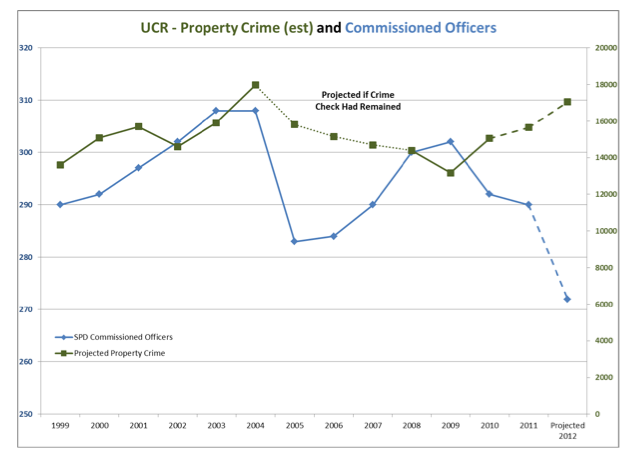 This will bias property crime reports downwards and the Spokane area property crime rate may go down. And Spokane institutions (and the police) will proclaim that the crime problem is getting better.